Environmental Science class Belize: Rainforests, Reefs and Ruin's trip to Belize in January 2011. Since 2005, IC students have gotten the unique opportunity to be observers in these annual international climate treaty conferences, one of only a handful of academic institutions to do so. This past December, students in the International Environmental Policy course attended the United Nations Framework on Climate Change Convention’s 16th Conference of the Parties (COP16) in Cancun, Mexico, accompanied by Professor Thomas Shevory. Ithaca sent observer teams to prior UNFCCC conferences in Canada, Kenya, Indonesia, Poland, and Denmark. 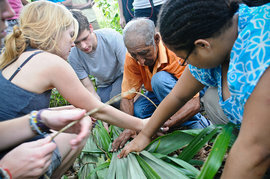 Belize: Rainforests, Reefs and Ruins is just one of several courses that combine classroom learning with a travel experience. Anthropological Experience in Hawaii: This three-week class involves fieldwork in the islands of Hawaii. Students study cultural resource management, environmental preservation, Native Hawaiian culture and history, migration, multiculturalism, and the impact of tourism. Italy: Language and Culture: This three-week program is based in Siena, Italy.The course is divided between conversational Italian practice and an overview of the history and culture of Italy (see page 15 to learn more). Health Care and Culture: An International Field Experience: Students travel to Malawi, Africa, to examine the effects of poverty, beliefs, behaviors, services and delivery systems on healthcare in an international context. During the first few days of the trip, we visited Xunantunich, Cahal Pech, and Caracol, ancient Mayan ruins. We had studied them extensively during the semester, but actually walking up the steep expanses of stairs and through the narrow passageways made everything more real. I drank in everything I could. I found myself clambering, wading, and swimming a third of a mile into Actun Tunichil Muknal Cave, which was used by the Maya for rituals and sacrifices (as evidenced by broken ceramic pots and human remains). In class we learned how the geology and climate of Belize had led to the formation of caves like this, and about the ceremonies performed here as part of the Mayan religion. Spending hours exploring the cave in person brought together all of those concepts, and ended up being one of the most fascinating, educational, and fun experiences of my life! The Mayan ruins and cave expedition made up just three days of the two-week-long expedition. Everyone spent a weekend living with the locals in the small town of Cristo Rey, getting to experience what life is like for a typical Belizean family. We helped (or tried to help) make tortillas, attended church services, and played with the children in our host families. While it was completely different from exploring an ancient cave, I found this experience just as important in gaining an understanding of Belize. I plan to keep in touch with my host mother and her beautiful children, with whom I established a friendship in just two days. From Cristo Rey, we moved to a much less populous region where we found ourselves surrounded by nothing but forest for miles. We went on day and evening hikes, studying animal tracks, plants, and bird species. Polo Romero, a traditional Mayan healer, joined us for three days, teaching us traditional Mayan techniques such as how to make a sling out of a cohune palm frond, or a stretcher out of materials cut from the jungle. He also taught us about the medicinal properties of plants that were found in the immediate area and how to identify them. He is a wealth of knowledge and a truly exceptional person, and we were lucky to spend so much time learning from him. We spent the last weekend on the coast of Belize in Hopkins. Besides having an absolutely beautiful beach, Hopkins boasts a vibrant Garifuna community, descendants of the Carib, Arawak, and West African people. We visited the Gulisi Garifuna Museum, which exhibits the history and culture of the Garifuna. During the day we went snorkeling on Belize’s barrier reef, and at night we drummed and danced with Garifuna musicians. Our time in Hopkins was nothing like exploring Mayan ruins or homestays in Cristo Rey, but it demonstrated just how diverse a country Belize is. I feel like I got to experience as much of Belizean culture as is possible in two weeks, and having taken the class prior to the trip really prepared me to get so much out of it. It truly was a once-in-a-lifetime experience!